Comments: New and in great condition with no missing or damaged pages. We ship daily except on Sundays. Need it urgently? Upgrade to Expedited. In Stock. 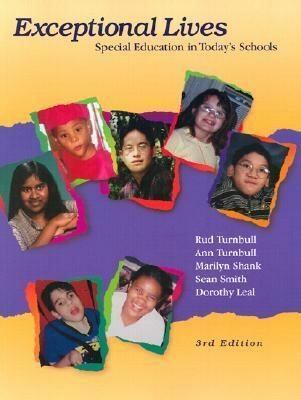 No other textbook provides a better introduction to the people and relationships that are an important part of special education. A Principled Approach: Strategies and interventions are based on six core values for working with students with exceptionalities: envisioning great expectations; enhancing positive contributions; building on strengths; acting on choices; expanding relationships; and ensuring full citizenship. Real People, Real Issues: Every student in each chapter's opening vignette is a real person. Within each chapter as well as in the My Voice and Making a Difference boxes, real people's stories are integrated to provide additional insight into the exceptional lives of students with disabilities, their families, and their teachers. A Focus on Inclusion: While acknowledging the very real challenges of inclusion, the authors believe that the great majority of students with disabilities can receive an appropriate education in general education classrooms if programs and classrooms are designed for individualized instruction, if supplementary supports and services are available, and if educators are prepared to work in inclusive environments. This book prepares educators to make inclusion work. Practical Ideas for Today's Classrooms: Newly organized chapters spotlight curricular goals and teaching methods, which are demonstrated in the Programs in Practice section of each categorical chapter. Into Practice boxes also share best practices for inclusive education. The Most Current Coverage: New coverage of important topics such as behavior management, assistive technology, and universal design as well as an increased focus on collaboration and early intervention. Hundreds of new references and resources have been added. Integrated Multimedia: State-of-the-art topical coverage is matched with new, integrated technology features: New Multimedia My Voice, Multimedia Making a Difference, and Multimedia Into Practice feature boxes have links to the companion website and ABC/Prentice Hall video library. Six new segments have been added to the ABC/Prentice Hall video library, for a total of 22 current and issues-based segments. An upgraded companion website, located at http://www.prenhall.com/turnbull , has valuable resources for both students and instructors. New companion website margin notes direct readers to online links where they can find more information about chapter topics. New Into Practice with Technology feature boxes appear in each categorical chapter.Turnbull, Ann P. is the author of 'Exceptional Lives: Special Education in Today's Schools' with ISBN 9780130308535 and ISBN 0130308536.